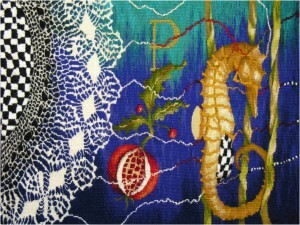 Tapestry artists, Dorothy Clews, in Queensland, Australia and Linda Wallace, in British Columbia, Canada met online nearly ten years ago. Their independent development and collaborative accomplishments are impressive. Those achievements were obtained from positions on the edge: they live far from major cultural centres, have only undergraduate degrees and are not connected to academia. 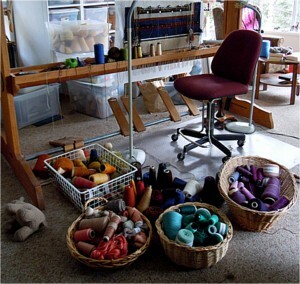 A further factor in placing them on the edge was their decision to push the traditional boundaries defining tapestry. In doing so, they risked exclusion from that network as well. 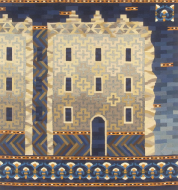 Both artists continued to maintain contact with the centre through volunteer work with the American Tapestry Alliance and by continued research into the history and traditions of tapestry. Those connections, while necessary to them, would not impede their decision to push at the edges. 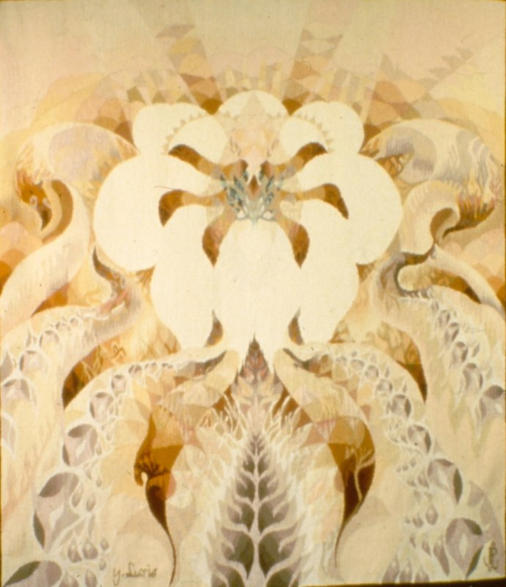 Together and individually, they researched conceptual ideologies underlying their work and playfully explored the intersections of tapestry with other media. Their relationship and those connecting elements were honed during their first major collaboration. “FindingHome @tapestry.au/ca began as a light-hearted, online discussion and soon developed into a playful game of creating a fantasy project. When the imagined exhibition began to feel possible, they contacted fellow tapestry artists and their project became a reality. 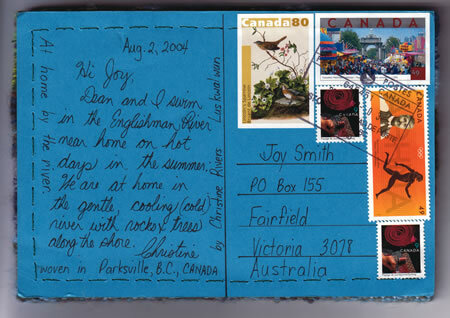 FindingHome connected thirteen Australian and thirteen Canadian artists, who created woven postcards, to exchange with one another, prior to the gallery exhibition. During the interactive process, Clews and Wallace asked the participants to discuss the theme of finding, and defining, the concept of ‘home’. Fifty tapestries were created and sent, but often their ongoing conversations and developing friendships had equal importance for the participants. 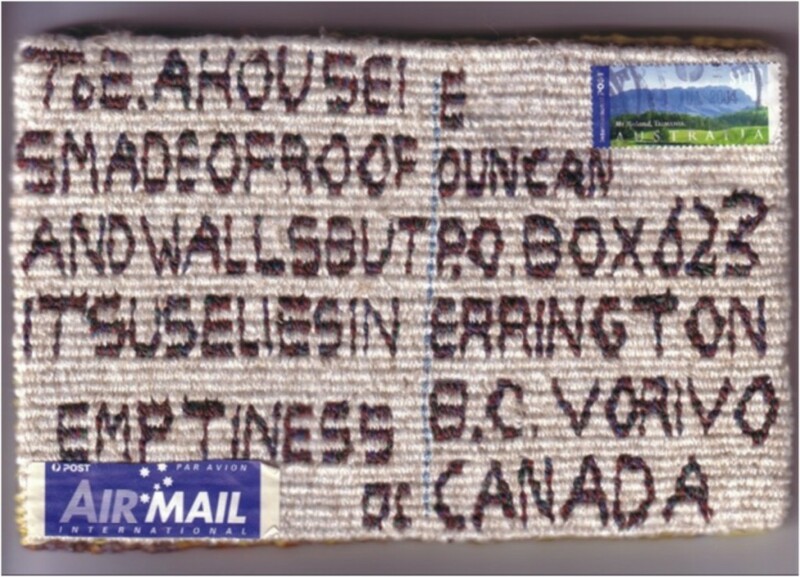 The resulting exhibition traveled to nine Australian and five Canadian galleries and became the inaugural online exhibition at the American Tapestry Alliance website. It was also covered in a four-page article, in American Style magazine.2 Neither Wallace nor Clews had experience as curators on this scale, nor had either of them managed an international, multi-person project. From positions completely ‘on the edges’, they pulled it off. The edges now seemed to be an acceptable place from which to create their work and to establish their positions. They achieved confidence in their abilities and freedom to develop into the artists they are, without regard to how comfortably they would fit into categories. Aware of the time honoured traditions where tapestry is viewed as an object of value, they purposely wove tapestries destined for destruction. Undermining the apparent initial loss of value, the hours of time devoted to the actions of preservation, cleansing and stitching, cause the conserved fragments to be re-valued. 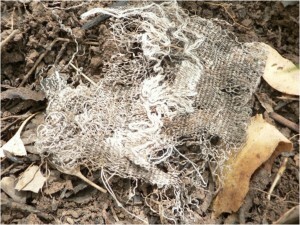 The ragged fragments: composted, reclaimed, conserved and stitched, question how preciousness is defined. 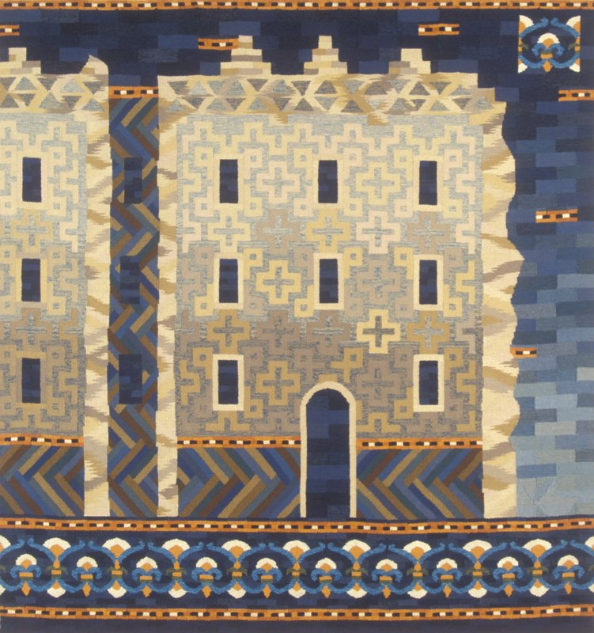 Wallace and Clews also project in their work the joint concept that all tapestry, as in all life, is ephemeral. 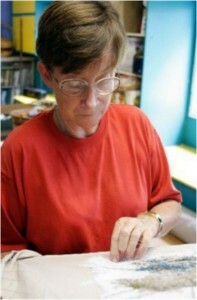 ‘FindingHome’ opened doors for Linda Wallace. The success of the project, despite the lack of funding and the outsider position of its two untried curators, bolstered her confidence. She now knew her work would be seen, if she refused to allow barriers to stop her. Audacity, dogged determination and work worthy of notice are a combination capable of leaping right over impediments. Just as important as confidence, was her realization that both decay and serendipity could be components of serious work. Those new ideas broke away the confines of tapestry’s grid structure and questioned her adherence to symbolic narrative imagery. The sense of freedom she felt, as she moved beyond traditional rules, was compounded by unexpected joy as she slowly transformed a jumbled mess of rotted textile into an object of beauty. She discovered a new found ability allowing her to transform the voice she uses, to communicate with the viewer. While maintaining a connection, she could now move from her earlier tapestries: woven line by line, gradually creating a preconceived image. No longer dependent on the use of intriguing imagery and luscious colour, she could use quiet beauty and a more gentle voice. Without the image, she needed to explore the possibilities of allowing the actual materials and the process to convey the conceptual content of the work. The search for the subtle tools needed to do that was a challenge. But, it was a challenge where playfulness could become a valuable component of the research. ‘The Infertility Series: Diminishment of Hope’ may be the final work Wallace creates directly on the issue of infertility. And even this series carries a more complex blending of conceptual thought. They reflect the strength and determination of infertile women, who maintain hope in the face of repeated failure. Rather than accepting infertility, many of those women continue their often lonely, always difficult, attempts to conceive. As a woman’s body ages, the possibility fades that a fertile seed will grow within her body. Reality slowly erodes the dream of holding her own child in her aching, empty arms. Without that child, infertile women experience a marginalization, a loneliness not comprehended by the fertile. And so, until age precludes hope, they strive to join those whose genes will be carried forward, into humanity’s future. The repetitive process needed to create this series gave Wallace a deeper understanding of the determination those women must have. It was created over a period of six years, and the artist’s own life shifted during that time. Menopause, retirement, and the death of both parents affected her view of both herself and of her placement on life’s continuum. The panels became more complex in concept. The materials and process she used, also addressed shifting cultural values on preciousness, on grief, on the importance of control. Loss and reclamation wove a new cloth from the eroded tatters. The Infertility Series: NonGravid: 04 April, 30 April, 26 May, 27 June, 22 July, and 28 August began by hand weaving six, small tapestries. Once woven, Wallace accepted the risk of irrevocable loss when she carefully placed them in the earth, and shoveled dirt on top of them. The unseen careful removal of the decayed fragment, its cleansing and conservation infer further hours of work. Beyond those stages and only evident when closely examined, is the multitude of tiny hand stitches, used to create and conserve a newly precious object. 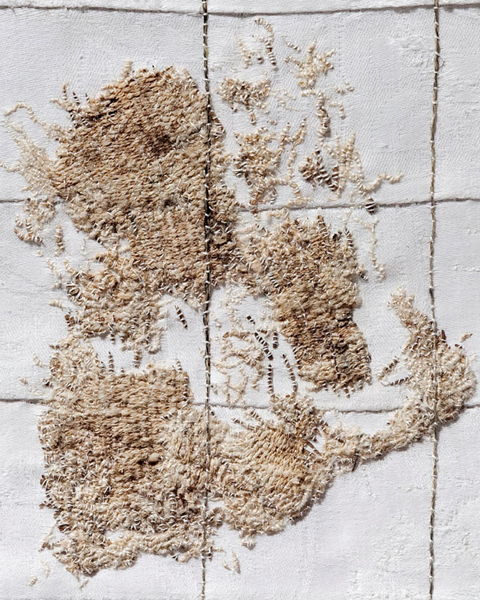 Further interplay between loss and preservation, and perceptions of preciousness was added to the panels by her decision to use her own family’s heritage linen to support the decayed fragments. 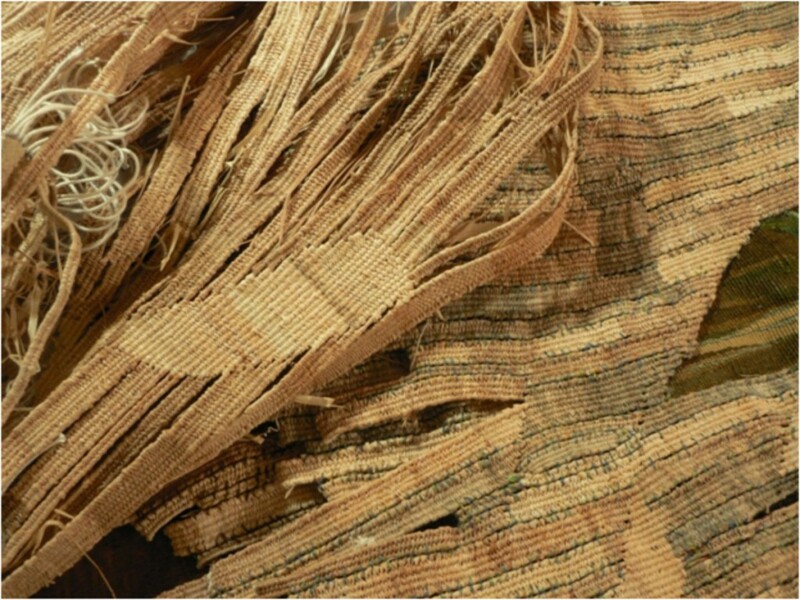 The antique cloth was first torn into strips, then methodically hand stitched back together, in random order. 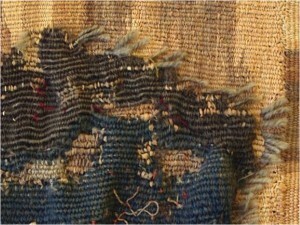 The tapestry fragment was carefully stitched onto the backing and the integrated layers provided structural support. Wallace then began the delicate process of following the path of each, individual strand of tangled yarn and gently, one by one, couching it to the backing. The action of the couching thread and the strand being stitched often dictated the final placement. The process became strangely collaborative. 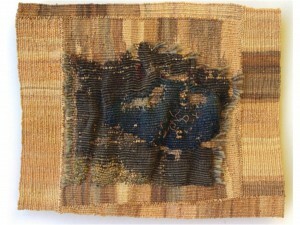 As panels developed outward, from the central infertile, decayed tapestry, new paths opened again for Wallace. Echoing her own life, she used stones and sand paper to erode the backing cloth, fraying the edges until they tore away. The solidity of the cloth was rubbed to fragility. The final stage in the creative process required even more stitching than the previous ones. Belgian painter’s linen was stretched over six wooden frames, and then each panel’s combined tapestry and frayed cloth was carefully placed onto its centre. 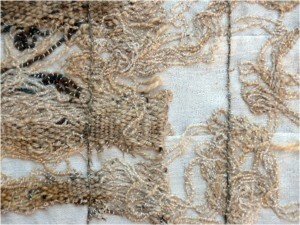 After criss-crossed lines structural stitches integrated the layers, the frayed edges were painstakingly couched to the backing, one fine thread at a time. The concept of how time is valued and the evidence of the artist’s hands are the ephemeral materials completing this series. 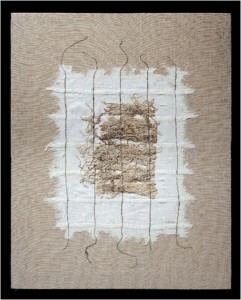 The works chosen for this presentation of Clews work grew out of the composted tapestries of the Field Trial Series. 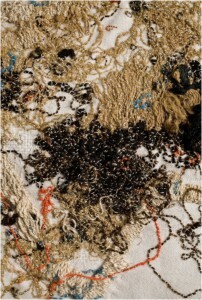 That series enabled her to work in a way that is not common in tapestry, reacting to the materials and the process, rather than the constructed woven image. 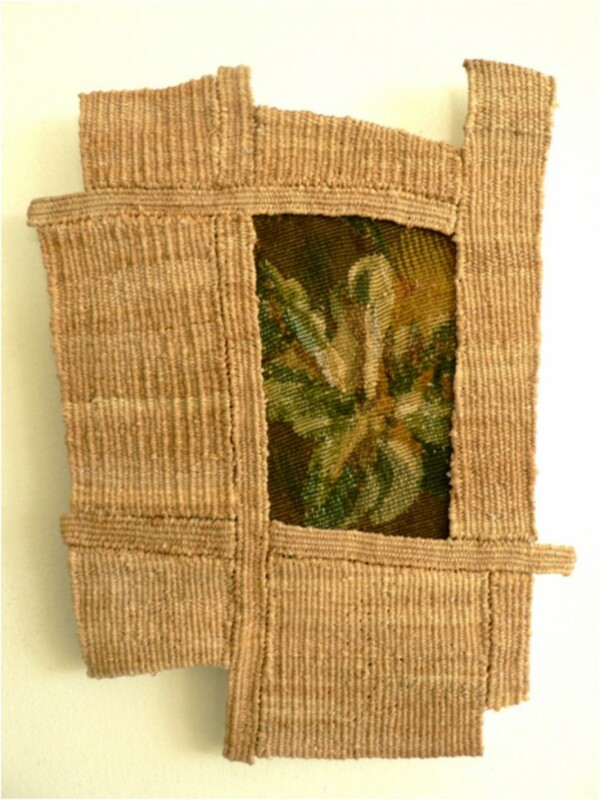 While creating works with her environmentally worn, decomposed fragments of tapestry she came across antique tapestry fragments for sale on the Net. This was the inspiration for the beginning of a series of tapestries commenting on landscape and culture: how the landscape affects us and our cultural artefacts, and gives the time worn, tattered fragments of tapestry new meaning. Raffia, retaining its characteristic dryness and slightly irregular quality, is reminiscent of the harsh arid landscape of Southwest Queensland where Clews lived. She says ‘a weaver has to a tune herself o the varied characteristics of each length; much like a gardener has to react to the environment and climate when gardening. There is a need to make adjustments as the work progresses’. Incorporating the fragments created a need to let the materials inform the process and the end result, letting go of preconceived ideas. ‘Antipodean Landscape’ comments on the adaptation, or not, of a European, western- based culture in a very alien environment. The raffia woven series reflects on the belief that the interactions between humanity, culture, and landscape are eroding. The existing Australian western- orientated culture fits oddly with the natural environment and the Australian myth that the Outback is the underpinning of Australian culture and way of life. That myth contrasts with the increasingly urban and city lifestyles and the eclectic mix of non-European cultures. Dorothy Clews Untitled work in progress. Conceptual and experimental work is looked at askance. With the nearest local regional gallery some 200 km away there is little opportunity for art to be seen and discussed in the community. Clews has had to seek out alternative ways of exhibiting her art in temporary pop up galleries and relying on online networks to provide opportunities, such as working as a regional artist in the Emerging Visions project at Canberra School of Arts. 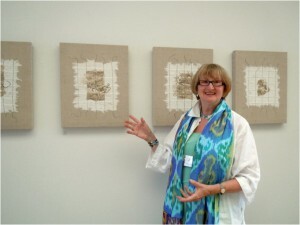 Both ‘Fallow Fields’ and ‘Antipodean Landscape’ have been accepted into juried tapestry exhibitions, however Clews was almost juried out of a non-juried exhibition with her composted and stitched tapestries. Experimental tapestry risks falling through the cracks between exhibitions of traditional tapestry, and exhibits excluding the textiles medium. The often-rigid definitions of ‘tapestry’ foster a form of monoculture; the growth of new forms and crossing of boundaries can be inhibited. In ‘The Space Between’ the fragment is woven in, rather than stitched, becoming more integrated with the woven raffia of the landscape around it. The stresses and strains of time in the fragment reflect the awkward fit of western culture within the Australian landscape. Spaces imply gaps – a void where changes happen; there is a call for the common perceptions of tapestry to grow and shift. No longer is it a dusty ancient artefact – there is a new role for these works, as a carrier of culture that speaks of frailty and robustness; integration and adjustment; relocation, reparation and care. Between the warps and wefts of these tapestries lie words current in both the political and ecological commentary in Australia. Themes promote diversity, but at the same time, those of bio-security – keeping the native environment pure – no weeds. No exotic plants. It is an environment that is reminiscent of the art establishment and the tapestry world that sometimes can appear to be very conformist, excluding those that do not fit within their defined limits. Weeds have a habit of growing in cracks in the pavement, leaping fence lines, prying apart barriers to grow and expand. They are hybrid, vigorous and diverse. 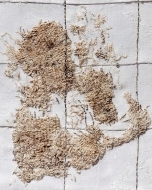 The image of tapestry as an unbound weed is an appropriate metaphor for Clews’ work, seeding and flowering freely to create an art form that moves around the edges and boundaries. For Clews the centre, the source is undoubtedly the landscape, its ecology. As she looks back to the past, drawing on tapestry’s rich traditions, she reaches forward to a time when materials, as well as potential viewers with the knowledge of tapestry, seem to be a fast disappearing resource. In conclusion, while Clews explored the edges of her Australian landscape and Wallace admired the strength of marginalized women, they learned about the edges themselves. They are places rich in synergy and opportunity, where overlaps benefit intersecting networks. Opening rigidly held belief systems, to permit changes to happen, could enrich the possibilities for the future of not only tapestry but also the wider world. 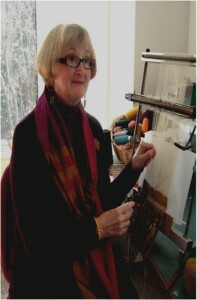 American Tapestry Alliance website. Online Exhibitions. Claire Patterson, “Special Delivery” American Style 51 (2006) 22-25.